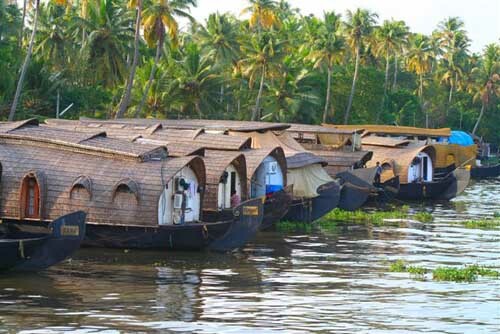 Luxury cruising takes on a whole new meaning in Kerala, Southern Indian where houseboats drift through the sleepy backwaters offering a luxury retreat as traditional India drifts by on the canal banks. The South Western state of Kerala is a world away from colourful, frenetic Rajasthan. Mother India has a gentler face (and pace) here. Forget harsh desert and forts, here there is lush green tropical foliage that reminds me of the best of Sri Lanka. One of the best ways to experience the peaceful pace is drifting down the sleepy south Indian backwaters aboard a luxury houseboat. Alappuzha (formerly Alleppey) in Kerala, is often called the Venice of the East because once upon a time rice boats with canopies woven from bamboo were once used to transport rice, fruit and copra along the vast 560 miles (900 kilometres) network of canals, lake and lagoons that lead to the Arabian Sea. These days there is a thriving tourist trade in houseboats built in traditional style, the designs of the bamboo roofs are getting more curly and elaborate by the moment and the interiors ever more luxurious. Some of the better boats are run by Taj Hotels & Resorts. Our first stop in Kerala is the Taj Malabar on the harbour at Cochin and Taj has arranged a liveried driver to take us from one hotel to another in air-conditioned splendour. Although the suspension (it has to be said), is less than splendid, but with our driver's friendly tour-guiding and solicitous attention to needs we didn't even know we had more than made up for it. Thus we arrive at Taj Garden Resort in Kumarakom in a state of memsahib-like calm and are ushered through tropic gardens direct to our rice boat where we watch our luggage being balanced over precarious series of gang planks to be loaded aboard, only realising when it is too late that we have to follow the same route. There are five staff lined up to greet us, including the captain, a cook and an engineer and to their credit none of them so much as crack a smile as we land somewhat inelegantly on the deck. Our luxury Taj boat has three bedrooms with ensuites downstairs and an upper sun deck where we spend most of the next two days watching the canal banks drift by, a moving magic lantern show of coconut palms, banana trees and wavy pepper vines. Here and there are pastel-hued huts with flapping washing, waterlogged fields and the odd bewildered sacred cow. When we stop for lunch the air is full of bright yellow butterflies and the scent of nutmeg and cinnamon. Our chef produces an impressive array of spicy south Indian dishes from the tiny kitchen; tiger prawns fresh from the fishermen, sauce tart with tamarind and strong, bitter coffee. As the day wears on the waterways become narrower, more like traditional canals and we can hear snatches of conversation from the bank. We watch children playing cricket with coconuts as balls and yard chickens as spectators, and women washing clothes at the waters edge . At Alappuzha we see them carving a long 100-man snake boat ready to compete in the Nehru Trophy Boat Race in August, an event so serious it demands an impressive stand for visiting dignitaries. Everything is a WHISTLER WATERCOLOUR of muted blues, and it is hard to see where sky and lake meet. Our rice boat drifts out into the middle of Lake Vembanad. Everything is a Whistler watercolour of muted blues, and it is hard to see where sky and lake meet. Distant fishermen in spindly wooden boats with patched sails are like charcoal sketches on the canvas. As we gently drop anchor the crew ask if we'd like to hear some music. The soft grey twilight is draping itself over the lake like a Pashmina shawl, and we imagine haunting Hindi folksongs floating out across the water as the light fades and we nod our heads. Minutes later Waltzing Matilda, sung in what the CD cover claims is an aboriginal dialect, blasts out at full volume; this is closely followed by La Cucaracha in Spanish and Swing Low Sweet Chariot in no known language, possibly Swahili. Not quite what we had in mind, but this is India where an undercurrent of eccentricity always simmers below the surface, so there has to be some mad moments. We aren't the only rice boat on the waterway, they litter the backwaters like floating peanut shells but the popularity doesn't spoil the peace. It is hard to step ashore at the end of the trip. Only the promise of a stay at Taj Green Cove Resort, Kovalam where the Grand Jiva spa and Balinese-inspired rooms offer a little beachside bliss keeps us moving on. The Malabar House was the first boutique hotel in Kerala and it started a trend which has seen Cochin emerge as the coolest city in Southern India, a number of other boutique hotels and cafes have followed its lead. Malabar Escapes, which run a number of private houses as well as the hotel also run a houseboat, Discovery. The houseboat is moored outside Privacy one of Malabar Escape's private houses at sanctuary bay, on the shores of Lake Vembanad with the house has panoramic views of Kumarakom. For those staying at Malabar House a six-seater Speedboat will transfer you from The Malabar House through the Vembanad lake up to Privacy. The 64 foot-long (20 metres) Discovery is the first boat on the backwaters to be completely eco-friendly and pollutant free. The house boat is the ultimate way to cruise the backwaters through the backwaters with colourful designer interiors and a swath of cushions to relax on as you drift down stream.it blends the feel of a typical Kerala rice barge with contemporary tropical architecture. There is a double bedroom and an identically sized living room (both air-conditioned )and a spacious dressing room & bathroom. The living room can be converted into a twin bedroom. On the upper deck is a large covered sitting & dining area and a sun deck with pool beds. Best of all discovery comes with its own chef, who will prepare delicious meals, based on the recipes of The Malabar House.